We often do not see the calories in the small little innocent items that we consume daily. But with each bite, it adds up to our caloric consumption. If we consume mostly carbohydrates, especially refined carbs…..really…we can really gain weight even though we may not feel that we eat a lot. This is especially if you always like to snack a lot on unhealthy or ‘comfort food’ like chips, chocolates, biscuits, pastries, etc. I came to observe this start difference when I notice how the different eating habits between two of my pet dogs contributed to their shape and size. The habits they display seemed similar to we humans. 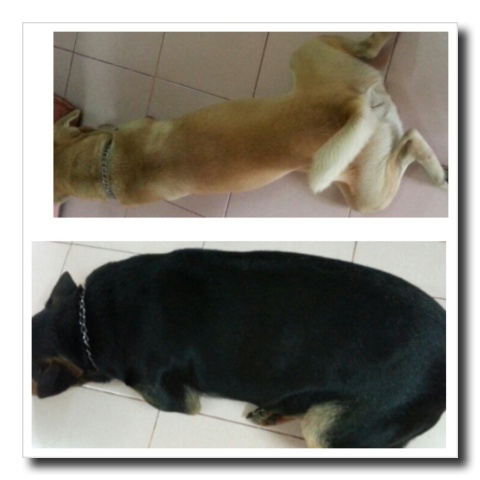 When you refer to the picture below, you easily see the difference in size between both the dogs- Edwin (the black colour dog) and Sabai (the cream colour dog). Both are male dogs and have not been neutered. Edwin eats predominantly a high carbohydrate diet. He also loved snacks, especially crispy things and bread. A very bread doggie. Even dogs also seemed to practice emotional eating. When Edwin was first brought back as a puppy, he was lerthagic and almost died due to worms in his stomach. But after he was dewormed- he became a very active and hyper dog- running around, jumping on and down on the sofa. After about a year we brought in Sabai as our beloved doggie Prosper had passed away. Sabai was a puppy from a stray dog and perhaps it is drilled into his genetics the need for survival. Thus, he had very strong fighter instincts. As he grew, he became the alpha male dog- bullying Edwin. It seems that somehow it had effected Edwin….he became more soft and no longer hyperactive. He also displayed signs of ’emotional eating’….eating not because he was hungry and he had the craving for comfort food which consists of highly processed carbohydrates. Of course, he also ate his normal dog food diet. The change in his physique was obvious- the weight he put on was mostly fat. His stomach became flabby, he seemed more lethargic and he was no longer that flexible. His legs also loses much strength- in the past, he could stand well on both his hind legs. How, it is only for a very short while. It did not seemed that he eat a lot but it is those little snacks that we allow him to eat when he looked at us with his haunting eyes. He eat anything, including vegetables and apples as well. Whereas Sabai is very different. Sabai is slim and sleek and does not have much fat in his body because of his dislike for carbohydrate food like rice, vegetables or fruits. He only wants to eat meat and bones. Sometimes he would come over and ask for food but if he was not given meat and bones, he would spit it out and Edwin would finish it up. Sabai also does not eat if he is not hungry. Once he is full, he would just walk away, no matter how nice the food is. Whereas, Edwin just keep eating. If he gets full, he would rest a while and later come back to finish up. We do try to control his food portion. RELATED: How to quit the bad habit of bingeing? But one thing though, due to Sabai’s dislike for fruits and vegetables, his intake of vitamin C is very low. As such, when he developed bruises, it took a very very long time to heal. Now, one thing though- dogs are meant to take a diet high in protein and not carbohydrate. Whereas as humans, we should not take only high protein and a very low carbohydrate diet. High protein diet like Dr Atkins diet is very damaging for our health.